Sailboats glide along Santorini’s caldera near the village of Oia. Look forward to seeing more of your sets from Spain! That yellow glow is something to behold. Mark Twain says it all. If not now…when. Thank you, Ruth. When I hear the question about whom I’d like to meet from any time in history, Twain would be one of those people. Someday, I’d like to get around to finishing his book, ‘A Tramp Abroad’ which chronicles his travels through Europe. Hope you’re having a lovely week in Colorado. We’re hoping to get out and do another mountain trek in the coming days. The September days have been lovely so far! Like you, I also love autumn, Ruth. We’ve had an odd September here though, with much rain – something I know you can relate to being in CO. Here’s hoping that you haven’t been affected by the torrential downpours or flooding there. To answer your question, no I haven’t read anything by Fitzroy Maclean yet, but I’m jotting him down for future reference. Sound like adventurous reads with much intrigue! Can you recommend any specific titles? That’s beautiful! I like your quote from Mark Twain. 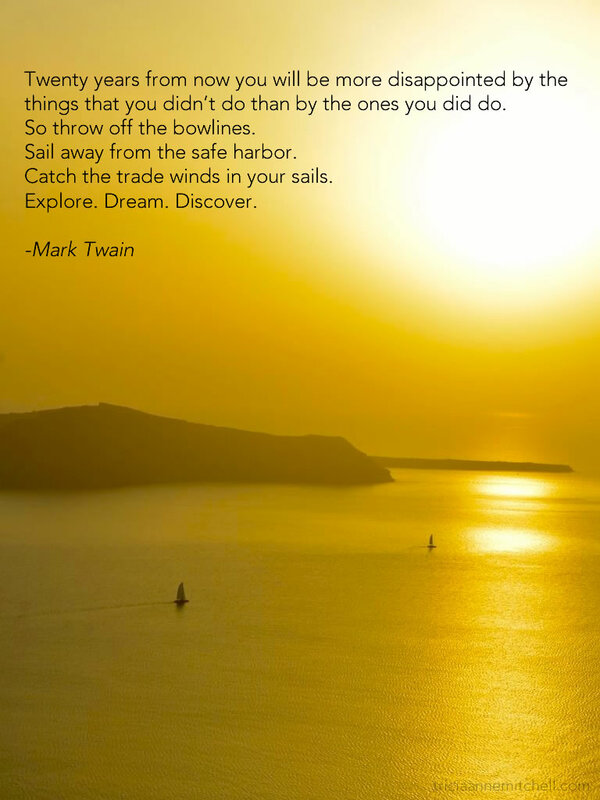 I enjoy Mark Twain`s wit and wisdom. It is refreshing to begin today with his words inscribed onto this beautiful picture to bring them alive. Reblogged this on Dark Matters a Lot. Agreed, Terri. Sometimes I feel as though I’m following in Twain’s traveling footsteps. He spent some time in Heidelberg, Germany (where I lived for 10 years) and Virginia City, NV (the camel & ostrich place I just posted about yesterday). I used to love going up near the then-abandoned inn that Twain stayed at during his visits to Heidelberg. The plot of land – which has stunning views of Heidelberg – has now been converted into luxury condos. Funny too that Heidelberg’s name means ‘huckleberry mountain’ in German. Racing camels I’ve heard about but not seen. And I didn’t know anyone rode ostrich, just ate them on a menu of exotic game. And they do it in Nevada? Wow! Quite a blend of cultures isn’t it, Victor? I didn’t share this anecdote in the camel racing post I did yesterday, but did read that the NV races started out when a newspaper editor in the 1950s joked that such races would take place. Most knew it to be a tall tale, but when a San Francisco paper published the story, it eventually became a reality! Many thanks, Jo. As you know, the scenery on Santorini is utterly fantastic, so it’s a challenge to take a bad image. Many thanks, Bashar. Seeing this image definitely ignites a sense of wanderlust in me. Being there once, I appreciate Your excellent photo very much. Glad the image brought back fond memories from this beautiful corner of the world, Sartenada. Did you visit other Greek islands while you were in Santorini?